Free things to do? Follow the ‘Royal Route’ from the Old Town centre to Wawel Hill and admire the unique architecture, including Gothic churches, royal residencies and Europe’s largest market square. Price of a bed? Hostels start at £7-£8 per night. Embrace your wild side – Belgrade is Serbia’s hedonistic, party-loving capital where the clubs are at capacity every night of the week. The nightlife here is somewhat unorthodox – bars can be found everywhere from an ex politician’s home to an old slaughterhouse! The city is buzzing all year round, but really comes alive in summer when the party moves from underground clubs to open-top barges that cruise down the Sava river until sunrise. Spend your days rejuvenating in Skadarlija, the city’s picturesque, bohemian district, where cobbled streets host traditional Serbian cafes, local artists and street performers. And be sure to visit some of Belgrade’s museums to learn about Serbia’s tumultuous recent past. Free things to do? Belgrade Beer Fest, held over five days in August, is one of Serbia’s most popular festivals and entrance is free (beer not included, sorry). The Temple of Saint Sava is the second largest Orthodox church in the world and one of the city’s most famous landmarks – a must see. Price of a beer? About £1.40 for the local stuff. Price of a bed? Hostels from £6 per night. Since gaining independence from Soviet rule in the nineties Estonia has blossomed, and the once grey streets of Tallinn are now bursting with colour and just waiting to brighten up your Instagram feed. Tallinn is a small city with a slow pace of life; get lost amongst its Medieval streets, enjoy the laid back cafe culture by day and sample some seriously good beer – Estonia’s favourite drink. Tallinn becomes even more magical in the winter when heavy snow and traditional Christmas markets turn the city into a fairytale scene. The bravest of travellers may also be interested in the bastion tunnels that run beneath the city and are said to be full of ghosts… though that’s one attraction I’ll have to pass on! Free things to do? Visit the Telliskivi Creative City to see a totally different side to Tallinn. This complex of abandoned warehouses has been transformed in to the hub of all things modern and creative, hosting everything from flea markets to independent theatre productions. This is where Tallinn’s hipster population hangs out! Price of a beer? About £2 – not as cheap as before its stag party boom! Price of a bed? Around £10 per night. Usually your best bet for finding a bargain in Europe is to go east, but as the cheapest capital in western Europe, Lisbon definitely deserves a shout out. Hop on one of the iconic wooden trams for a DIY tour of the city – for just over £5 you can go anywhere you like for 24 hours. That’s enough time to hit the beach, explore the historic streets of Alfama and eat your bodyweight in custard tarts. If you’re not too tired, head down to the Barrio Alto district at night to wine and dine yourself in some of Lisbon’s coolest and quirkiest restaurants and bars without breaking the bank! Free things to do? Not only free but also bizarrely unique to Lisbon; visit the ‘Fantastic World of Portuguese Sardines’, a shop stroke museum that celebrates Lisbon’s love for the humble sardine. There’s a sardine throne, a sardine ferris wheel, and you can even get your own sentimental tin of sardines from the year you were born! Price of a beer? About £1.50 in Barrio Alto. Price of a bed? Decent hostels start at around £12. Known as the ‘little big city’, Slovakia’s tiny capital can easily compete with cities twice its size. It’s nice and compact, so all major attractions are within walking distance and you shouldn’t have to fork out on transport costs, bonus! Take a peaceful stroll down the Danube river where locals will be dining and sipping coffee bank side. Wander through the Old Town where you’ll browse for handmade Slovakian goods and admire the mismatch of wonky buildings that make the city so unique. Climb up to the awe-inspiring 13th century Bratislava Castle and gaze over the entire city. And whatever you do, don’t forget to drink plenty of Slovakian wine; some of the best on the continent! Free things to do? Of an evening, catch a free film screening at (manmade) Magio Beach, then stick around to watch the sunset over the Danube. Price of a beer? From £1.20 – last year, Bratislava was named as the cheapest city in the whole world to buy a pint! Price of a bed? Hostels from £8 per night. This once troubled city is now opening its arms to tourists, and its cheap cost of living means that it’s starting to attract backpackers from across the globe. Sarajevo is a fusion of cultures with a mixture of Balkan and Turkish influences dating back centuries. This is apparent in the city’s people, shopping bazaars and incredible food served up in the Old Town’s many restaurants. Think hearty dumplings, pastries and stews stuffed full of top quality local meat – and don’t forget to try the famous local plum brandy! Also be sure to take the newly reopened cable cars to the top of Mount Trebevi? for unmissable views. Free things to do? A lot has happened in this little city, so take advantage of the free walking tours that run every day. Learn the history behind every landmark and visit the spot where the assassination of Franz Ferdinand took place. Price of a beer? About £1.70, but in Sarajevo it’s all about the brandy! Price of a bed? Hostels from £7-£8 per night. One of Europe’s oldest cities and the largest one on this list. Kiev is still relatively un-touristy, so prices have remained low and authentic Ukrainian experiences are easy to come by. Visitors can enjoy a vibrant nightlife scene; techno is very popular and there’s an abundance of clubs in the city centre. If clubbing isn’t your thing then don’t worry, the street is the place to be in Kiev – you’ll find cars and trucks converted into pop up bars and cafes just about everywhere! Kiev has lots to do, but perhaps the biggest draw for tourists to visit Kiev is the fascinating opportunity to visit Chernobyl and see where one of the world’s worst nuclear disasters took place – a haunting but unforgettable experience. Free things to do? Visit the breathtaking baroque style St Andrew’s Church, one of Ukraine’s most famous landmarks, where you might even spot a traditional Ukrainian wedding taking place. Price of a beer? Less than £1 from a street vendor, though prices in clubs are higher. Price of a bed? Hostels start at under £5 a night – seriously! Although its growing popularity means it’s more expensive than it once was, there are still plenty of bargains to be found in Budapest. To feel the buzz of the city you don’t have to go much further than its ruin bars, abandoned buildings and spaces turned into hip drinking spots where the beer is good – and cheap! Swim with the locals in the iconic thermal baths that are said to have healing powers… I can neither confirm or deny, but they’re definitely relaxing! After a soak, fill up your belly with a classic ‘peasant dish’; warm goulash with heaps of bread – not only delicious but easy on the wallet too! You can find it, and many other tasty dishes in plenty of cheap restaurants in Budapest. Price of a beer? About £1.40 in many of the ruin bars. Price of a bed? 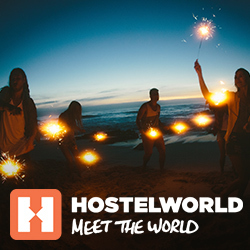 Totally amazing hostels from £7! Free things to do? There’s plenty of free things to do in Budapest. Hike to the top of Castle Hill for incredible views of the city on either side of the Danube river. Stay to explore the beautiful gardens of Buda Castle which are open to tourists all year round. Riga has overtaken Prague as the stag party capital of Europe (but don’t let this put you off)! Party-goers are drawn by low prices and an ever expanding nightlife scene that features everything from super clubs to cheesy karaoke bars. One thing they all have in common is a full supply of Black Balsam, Riga’s (in)famous dark drink that’s usually mixed with vodka and seriously lethal – you have been warned! If your head isn’t too sore in the morning head to Riga’s Central Market, the largest market in Europe, where you can haggle for souvenirs… if you can withstand the chaos! Spend the rest of your time mooching around the seriously photogenic Centrs neighbourhood, home of art nouveau buildings, adorable cafes and boutique shopping. Free things to do? Escape the city and go hiking through Riga’s beautiful and green Kronvalda Park. Stroll along the canal that runs through the middle and even try your hand at rollerskating down one of the park’s skate lanes. Price of a beer? Around £2. Price of a bed? £7 upwards – and there are plenty of party hostels in Riga! I couldn’t finish this list without including a UK city. Everybody knows it’s cheaper up north, and Liverpool is the best of the bunch. Food, music, culture and nightlife, Liverpool really has it all. An ideal weekend would include: discovering the city’s creative hub The Baltic Triangle and feasting at the Baltic food market, getting a taste of Beatlemania and exploring Liverpool’s musical history at the iconic Cavern Club, or celebrating a football match with some of the most passionate fans in the world. If you have time, squeeze in some retail therapy at Bold Street’s many independent shops to bag yourself something unique. Free things to do? Take a stroll around the waterfront and the world famous Albert Docks where you’ll find the Tate art gallery – also free entry. Also be sure to visit Chinatown to see the largest Chinese arch outside of China, a very impressive sight! Price of a beer? Students will know all about £1 bottles in The Pilgrim pub! Price of a bed? Hostels from £10 a night. The post Easy on the eye, easy on the wallet! Cheapest European cities 2018 appeared first on Hostelworld Blog.